Our regular Obstructed View columnist Ross Crombie gives his view on the booing of Mikel Arteta during last weekends win over Arsenal. Keep an eye out over the next couple of days for a pro-Arteta article. This could have been called ‘hero to zero’ as I reflect on the booing of one-time idol of Goodison, the best little Spaniard we knew, the sidekick of another Goodison legend, the one, the only, Tim Cahill. No booing from me, and in truth none from those around me in the Upper Gwladys, but there’s nothing that irks a Blue more than when a former hero kisses the badge of his new club when scoring against his old one. A certain Mr Rooney has suffered the same fate almost every year since he left and certainly since he scored at the Park End. Personally, I thank Arteta for some glorious moments, more than moments, running whole games, spraying magnificent passes left and right, and even the odd well-timed tackle; I do begrudge his seeming inability to clear the first man at corners, and my heart still hasn’t recovered from the penalty howlers that night against Kharkiv, so I’m not doing a complete hindsight review in the rose-tinted specs. Booing usually spurs former idols, or indeed former Kopites, to better things against us, and I’m not sure I see the point frankly, other than clearly to make our displeasure known. Better for me to roundly applaud them, make them feel guilty, maybe even make them miss a few passes because they’ve gone all misty-eyed, rather than waste time and energy booing the opposition rather than cheering our own team. I would just say, even allowing for how adrenalin can help top sportsmen and women do things they’ll regret, that Arteta did show a distinct lack of class in kissing the badge when he scored the penalty in the FA Cup. Given how clever the man is, given that his career was re-ignited by Everton, and given that his boys were both born on Merseyside, I’d have expected a bit more class from him. Perhaps the OG was a bit of karma. Somehow can’t imagine Cahill ever returning in the opposition and kissing his new club’s badge on scoring. Enjoyed the piece but it was Andy Johnson was the fella missing the penalties against Kharkiv mate, not Arteta. 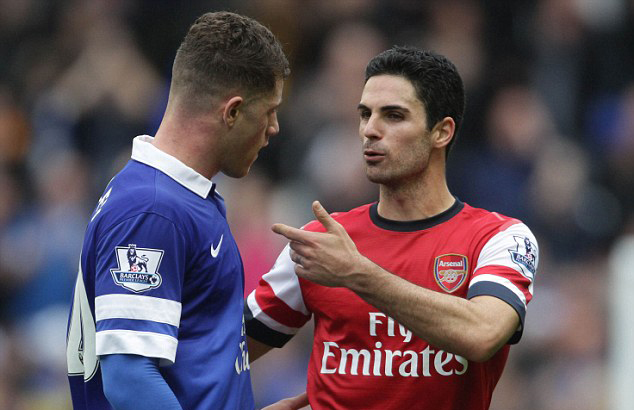 Not arsed about Arteta kissing the badge, they pay his wages and the fans love him (or did) – part of his job. I started booing due to his cheating tactics. Diving, feigning injury, calling for Everton players to be booked … straight out of the Moyes book “Do as I say, not as I do”. Now he can go kiss the badge again, my sheriffs badge!!!!!!! No problem with Arteta kissing the badge, they pay his wages and the fans (Arsenal) love him (or did) … part of his job. I started booing when he started cheating. Diving, feigning injury, trying to get Everton players booked … straight out of the David Moyes book “Do I say, not as I do”. Mikel can go kiss the badge again, my sheriffs badge – dirty cheat! Don’t forget the rolling round on the ground pretending his leg was broken during the cup game & having the ball kicked out. He had only lost his boot…… Go what he deserved Sunday. The entire premise surrounding this article, Arteta’s purported badge-kissing, didn’t even take place. He clearly grabs the shirt at the badge, no kissing though. Really bad ‘journalism’. The booing,although mostly about osculation of a bit of cloth,was also about his rolling around as if shot,when in fact he was OK.He conned Leighton Baines a former team mate and stopped a promising attack. It was certain that this was going to happen because most bulletin boards were full of fans talking about giving him a rough time. At Goodison his reception put him off his stride and may well have contributed to his mistake,although I actually think Kevin kicked his foot onto the ball with enough force to propel the ball over the line.What has changed my opinion of him though was the snide arm into Ross’s gob and subsequent arguments with the lad when he complained and with Leighton who was trynig to defuse it as skipper..
Andy Johnson missed the pens v Kharkiv I’m sure?